I get opportunities to judge food-related contests all of the time. I'd like to think that people respect my culinary knowledge and my seasoned opinion when it comes to food. The Carolinas Peaks to Piedmont Girl Scout Cookie Dessert Recipe Contest was no exception. This time, the cause was a little more near and dear to my heart. I mentioned in my last post my affiliation with Girl Scouts but what I didn't mention is my obsession with Girl Scout cookies. 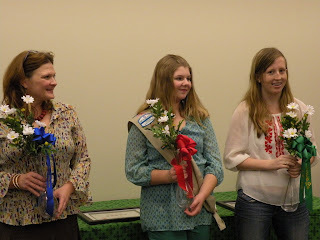 My 2nd year as a Junior Girl Scout, I sold enough cookies to come in 3rd place among all of the cookie sellers in my region. My 3rd year, I came in 2nd. 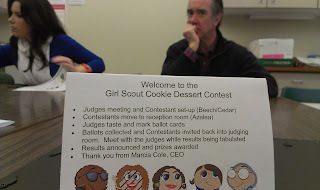 I've sold over $6,000 worth of cookies during my girlhood. And "back then" boxes were $2.50 (They're only $4 now). And now I'm on a quest to eat that many cookies. Just kidding. Enough about me, let's move on to the cookies. And the cakes. And the pies. Winston-Salem Journal food editor, Michael Hastings, wondering what I'm doing as WXII's Nicole Ducouer looks on. Score sheets, ready to go! 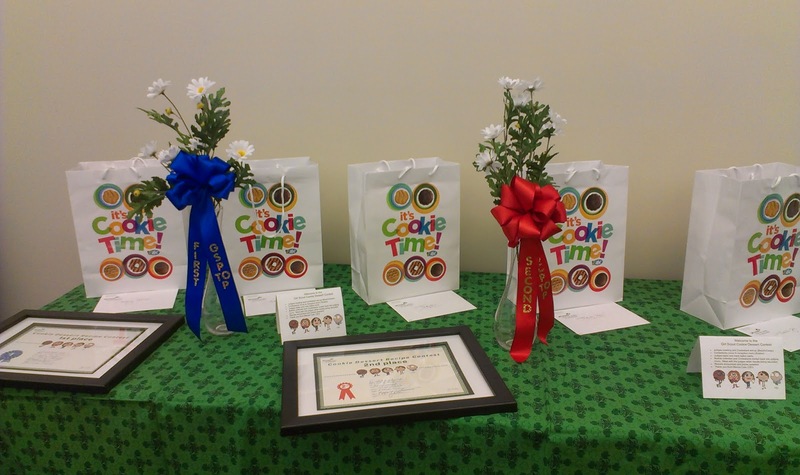 There were only a few contenders, as this was the first year of the contest, but every entry was creative and the presentations were all outstanding. I was impressed by all of the showings. 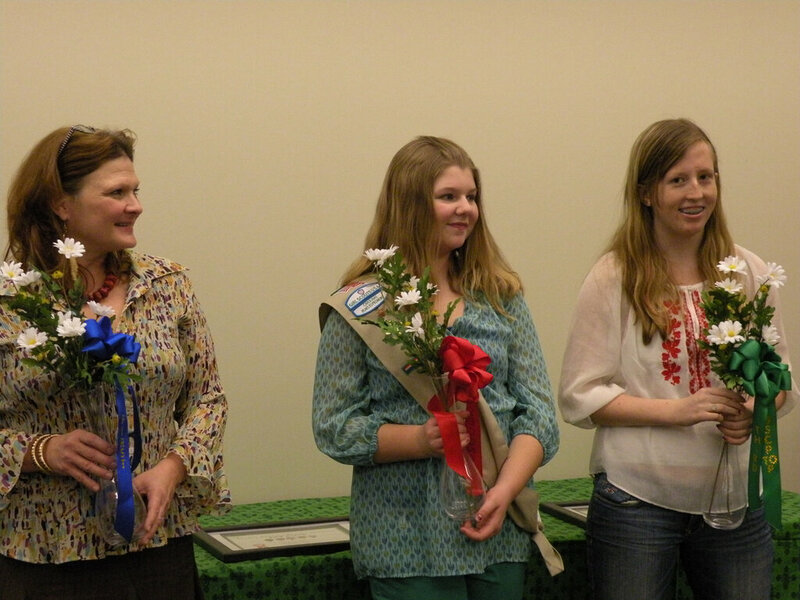 The contest was open to any and everyone--Girl Scouts and non-Girl Scouts alike. Professionals, amateurs, home cooks and everything in between. 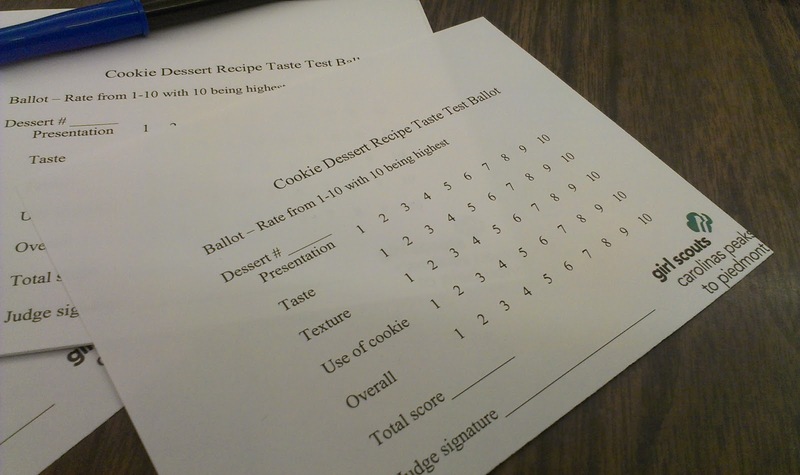 If you wanted to buy a couple of boxes of cookies and put your recipe in the ring, it was open! 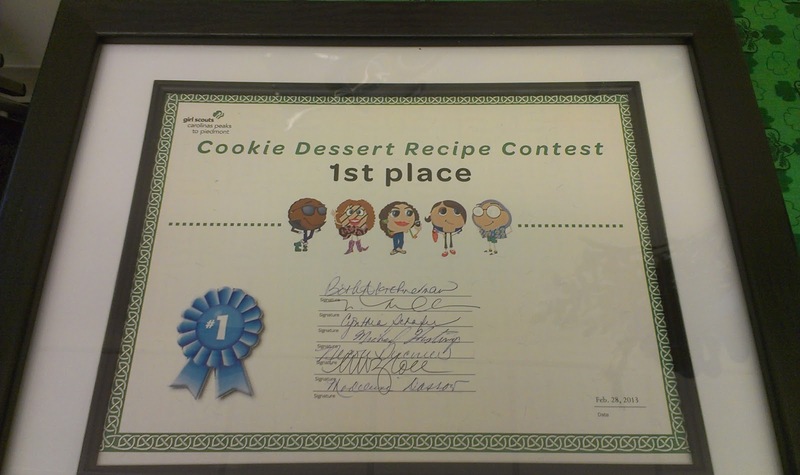 The winning desserts and their recipes are below. Before starting, preheat oven to 350 degrees. Make sure cream cheese and eggs are room temperature. Put 1 box of Lemonades into a gallon ziplock bag. Crush into fine pieces. Press the crushed cookies into a 10 inch spring form pan. Bake for 5 minutes. Let cool. Sprinkle 2 teaspoons grated lemon rind and chocolate shavings evenly over the cake. 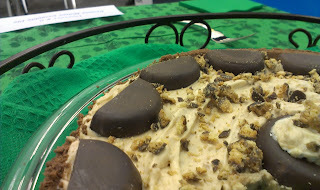 This easy to make frozen pie uses 2 types of Girl Scout Cookies; Peanut Butter Patties and Peanut Butter Sandwich cookies. Mix together peanut butter, cool whip, cream cheese, butter, sugar, and milk with an electric mixer. Blend until creamy. Crush 8 Girl Scout Peanut Butter Sandwich Cookies in a food processor or on a cutting board. Blend into mixture. Pour in pie crust. Cut 6 Girl Scout Peanut Butter Patties in half. 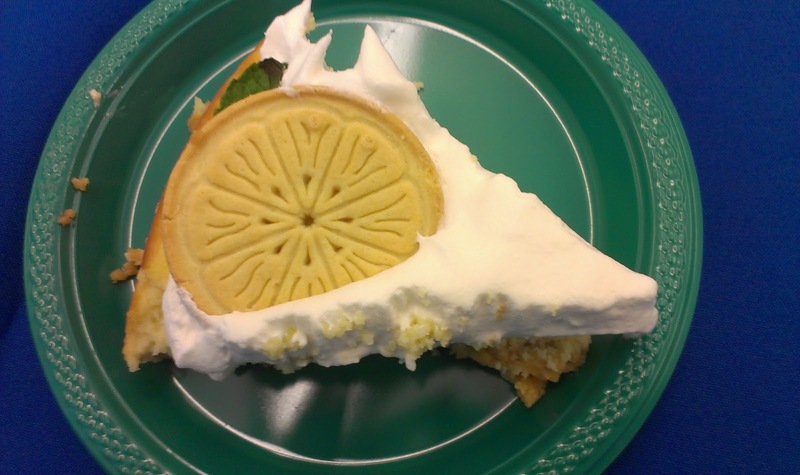 Place around edge of pie crust. Use 1 whole cookie for the center and garnish with a drop of pie filling. Crumble the last Peanut Butter Pattie and sprinkle over top of pie. Place in freezer overnight or until frozen solid. Serves 8. One of those bags has my name on it. Or near it. Chock-full of caramelly goodness. And first place-edness. In a bowl, combine the first 5 ingredients; cut in butter until crumbly. In a bowl, whisk egg yolk and creamer, add to dry ingredients juts until moistened. Stir in the crushed Carmel deLites cookies. Turn onto a floured surface; knead 10 times. Divide dough in half. Pat each portion into a long rectangle, cut into triangle wedges. Place on a greased baking sheet. 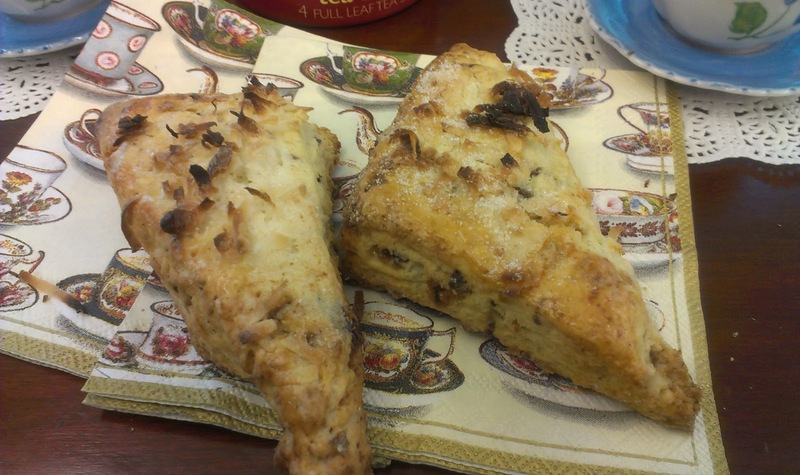 Beat egg white brush over scone wedge. Sprinkle with flaked coconut. Bake 45 degrees for 12-15 minutes or until golden brown. oooooo I think that Peanut Butter Crumble Pie would be my favorite! I was a brownie and a girl scout when I was younger, I remember selling box after box of cookies haha. Still love them to this day!